Lock in a great price for Saint Ivan Rilski Hotel & Apartments – rated 8 by recent guests! The view was great, the area was calm, close enough to the center. The underground parking was fine and the price is OK for it. I've been going to this hotel for a few years now. The location is not the greatest but it's still walking distance to our standards if needed (for example in the evening if you want to eat out). Spa is okay, though the biggest problem is that people don't know how to use it and there are no instructions to educate users. Pool is nice but it's mainly a kids attraction, which makes it hard for grown ups to use it without being splashed/ jumped on. Sqeekish sounds included :-).. Overall is a nice hotel, no surprises, good price for what you get. The location of the hotel is great. This is my second time coming here and I really enjoy staying in this hotel. Great place to stay, very cosy, clean and comfortable. Pool is good as well. The spa is awsome, especially if you get some of the procedures, like massage, staff are very proffesional. Will come back! The rooms were big and clean, it was so hot and confortable. Great view of both mountains and the staff was welcoming and helpful. Room is very big and clean, bathroom is nice, comfortable bed. The pool and the area around the pool. Because it's not a season there were sun beds and umbrellas enough to enjoy the beautiful mountain sun. Otherwise, if the hotel is full, those 20-30 sun beds can not satisfy even half of the guests. The apartment was clean and comfortable, has a kitchen and you can afford a longer period of rest and cook for yourself. They left us on Sunday to check out later without any charge. I found the staff very polite, the room was clean, great food in the restorant. Good sauna and swimming pool. Saint Ivan Rilski Hotel & Apartments This rating is a reflection of how the property compares to the industry standard when it comes to price, facilities and services available. It's based on a self-evaluation by the property. Use this rating to help choose your stay! Located just a 5-minute drive from the nearest ski elevator, Saint Ivan Rilski Hotel & Apartments is an all-seasons residential and holiday complex offering functional, generously proportioned accommodations. Free access to swimming pool, steam bath, sauna and free shuttle to the gondola elevator is included in the rates. All rooms at Saint Ivan Rilski Hotel & Apartments have been tastefully decorated with bright carpeted floors and dark-wood furnishings. Free internet connection is also available in every room. The 4-star Saint Ivan Rilski Hotel & Apartments stretches over an area of 43 ft² and it offers multiple additional services on site, such as a medical center and a kindergarten. Do not miss the 3.3 ft² health and sports center, which includes a luxurious spa and an indoor swimming pool, which is illuminated with natural light and features a wide relaxation area. You will be able to choose from 2 different restaurants, including a “mehana” or traditional Bulgarian restaurant, and there is a lobby bar. 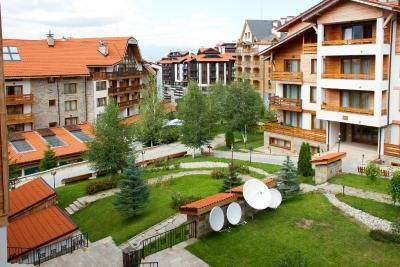 The town of Bansko, which lies just below the Saint Ivan Rilski Hotel & Apartments, is only a 15-minutes walk. Bulgaria's capital Sofia is 99 mi away and the Greek border is 34 mi away. 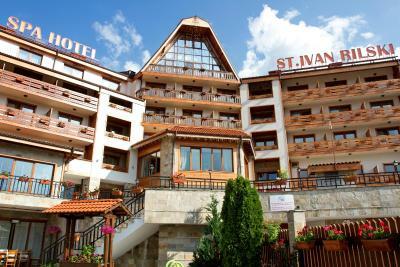 When would you like to stay at Saint Ivan Rilski Hotel & Apartments? Free access to swimming pool, steam bath, sauna and free shuttle to the gondola elevator. The studios are located in the villas behind the hotel building. Please note that this studio can accommodate pets. Bedroom, living room with equipped kitchenette. Located in the villas behind the hotel building. Please note that this apartment can accommodate pets. This apartment is located in the villas outside the main building. Free access to the swimming pool, steam bath and sauna is provided, as well as free shuttle to the gondola elevator. This double room features bathrobe and soundproofing. Please note that guests may be accommodated in an attic room without balcony, upon availability. House Rules Saint Ivan Rilski Hotel & Apartments takes special requests – add in the next step! Saint Ivan Rilski Hotel &amp; Apartments accepts these cards and reserves the right to temporarily hold an amount prior to arrival. Saint Ivan Rilski Hotel & Apartments accepts these cards and reserves the right to temporarily hold an amount prior to arrival. Please note that pets are only allowed in studios and family apartments. Please note that on 08 December and 31 December the standard buffet dinner will not be available. Please note that an optional gala dinner will be available on the 08 December and 31 December which can be booked directly at the hotel. Reservation in advance is required. Unfortunately the credit card policy is a little bit strange. The amount taken as an authorisation is still pending, but it will be back after all. Nevertheless, the system should be modernised. I didn't like the open doors of the vacant rooms in the building. Anybody could enter and take or destroy something. Breakfast was poor. Also quality of the products used at breakfast was low. There were very limited options and especially in bread. They could do much better for a 4 star Hotel! The staff was genarally just OK but they could also do better. Should be more willing to serve the customer... At the front desk at my check out, they had charged my credit card for the 1st night once (as a deposit they said) and then at the end they charged me again the whole amount!They said that they would return me back the 1st day charging in due time( about a week).I guess I have to see how this is going to work but it is certainly 100% an unproffessional behaviour! Mediocre quality food and beverages on breakfast, not very well maintained elevators, not very good quality of the renovation works of the rooms and other facilities, SPA area not adequate of the hotel capacity, not very good infrastructure around the hotel, free-parking infrastructure not available at all - everyone parks wherever on the road. In general - it’s better on pictures than in reality. The studios are outside the main building and there is no elevator. It was far from the main building and actually not comfortable for using the SPA. There was no ventilation in the toillete in the room. The parking is charged extra and we were trapped inside because of maintenance works to the door without previous notice. When we asked for a compensation for the inconvenience we were told to wait for the hotel's driver to come and pick us up and take us whenever we wanted. We waited for 40 minutes only to find out that the driver was willing to take us a few meters away-distance which we could have covered on foot. Finally the door was fixed 15 minutes later and we managed to get out with our car. They did not even consider compensating us for all this mess. I didn't like the staff in this hotel. Except the staff in the spa center. The woman working in the reception is not interested in everything that we asked for. She was acting like we were there for free, but not that we paid. Also, the guy with the shuttle bus. We were searching for the bus,looking,looking on the parking,while he was sitting inside like nothing is happening.We have to put our ski alone.No help. P.S. I think that the lifeguard should tell children not to jump in the pool.Also,to adults not to show their swimming skill,because it is a relax pool.Also there are people in it. Thanks. Everything was excellent.The breakfast, the amount of food, it was tasty,fresh etc. The pool was clean and the water was hot. The rooms were so comfortable,big, with everything in it. Food is not the freshest, dinner was almost always cold. Breakfast was always the same - they serve a variety of pastry which is not fresh. Limited options for vegetarians. The Spa is nice, rooms are spacious, comfy and very clean. The room was not as clean as expected, specially the bathroom and some nails on the balcony. They should pay more attention to this as it is a 4 🌟 hotel. Parking conditions. The fee is 10BGN for night for the underground parking, I need to use my car all day and in the evening and I asked to park in front of the hotel, staff told me it's not allowed, although few cars with non Bulgarian numbers were parked there for all my stay. The pool and the room where perfect. Cleaning too. Breakfast is basic and same every day. Apartment is spcious. Spa is good experience.